What is Pertussis Disease (Whooping Cough)? Pertussis, also known as whooping cough, is a highly contagious bacteria respiratory disease. Pertussis is known for uncontrollable, violent couging which often makes it hard to breathe. After coughing fits, someone with pertussis often needs to take deep breaths, which result in a "whooping" sound. Pertussis can affect people of all ages, but can be very serious, even deadly, for babies less than a year old. Pertussis is a highly contagious disease and can affect up to 80% household contacts. Symptoms of pertussis usually develop within 5 to 10 days after you are exposed, but may not develop for as long as 3 weeks. --Subtle onset of runny nose. --Apnea or stop breathing when asleep. --Fits of many, rapid coughs followed by a high-pitched "whoop" sound. --Throwing up during or after coughing fits. --Very tired after coughing fits. Pertussis is spread from person-to-person. --Spend a lot of time near one another and share breathing space. --Some babie get pertussis from older siblings, parents, or caregivers who might not even know they have the disease. The best prevention for pertussis is vaccine, but no vaccine is 100% effective. Ask your doctor or your local county health department. Email the Alabama Department of Public Heatlh, Immunization Division, at immunization@adph.state.al.us. Go to cdc.gov and type 'pertussis disease' in the SEARCH box. Who should get pertussis vaccine? There are 2 vaccines which protect against pertussis. DTaP for children up to 6 years of age and Tdap for people 7 years of age and older. People who have not been vaccinated and are in contact with a baby. Babies beginning at 2 months of age, followed by a total of five doses through age 4-6 years. Adolescents aged 11 through 18 years should receive a single Tdap. Adults aged 19 through 64 years should receive a single Tdap. Pregnant women should receive a Tdap for each pregnancy. Anyone who has not receivied the full five doses of pertussis vaccine. Either if you are exposed to pertussis and/or have the disease, you should still recieve vaccine containing pertussis. All adults are recommended one dose of Tdap as soon as possible, especially if pregnant or in close contact with infants. --Pain, redness, and/or swelling where shot was given. --Local reactions such as pian, redness, or swelling. --Non-stop crying, for 3 hours or more. Ask your doctor, or local county health department. Email the Alabama Department of Public Health at immunization@adph.state.al.us. Go to cdc.gov and type 'pertussis vaccinee' in the SEARCH box. Read, print, and share our Pertussis Fast Fact Flyer to learn more about pertussis disease and vaccines. 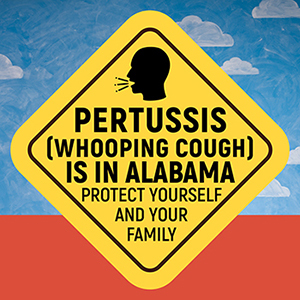 News Release: Public Health warns of increased pertussis cases in Alabama (08/14/2017).